It’s not often that I play social games on Facebook, mainly because I don’t like to spam my friends with constant notifications. No one likes to get those, especially every single time that someone does something in the game. I just don’t feel the need to be “that guy” on Facebook who does nothing more than spam his friends with countless game requests. SimCity Social has me so infatuated that I don’t really care if I end up being that guy. I was a big fan of SimCity 2000, as was most of the gaming public. Hearing that SimCity would be making its way to Facebook at E3 this year, I was skeptical and had an attitude of “Oh great, another Facebook version of a popular game to clutter up my feed.” I didn’t have the greatest of outlooks, but after everything that Facebook games have done to us over the years, I’m not sure it’s entirely undeserved. The early days of Facebook games like Farmville and Mafia Wars didn’t leave us in the best of moods. Dozens of daily requests, news feeds cluttered with things that players had done in the game, posts on your wall with a request for you to trade items in a game that you hadn’t even played. It was a mess, and still is to some extent, but it’s good enough for now. SimCity Social is the one game that has me so genuinely in love with the format that I don’t really care about spamming my friends as much as I used to. It's still a 'ville-style game, there's no denying that, but it works. I was always a tad afraid that I would send things out just by opening the game, but SimCity Social makes it very clear when you’re going to involve someone else, while still actively encouraging it. That may be due to some new Facebook Game guidelines, but either way, it’s a good change. It’s cute and fun. It’s all about building your city and watching it grow, but, as the name implies, it’s also about social interaction. 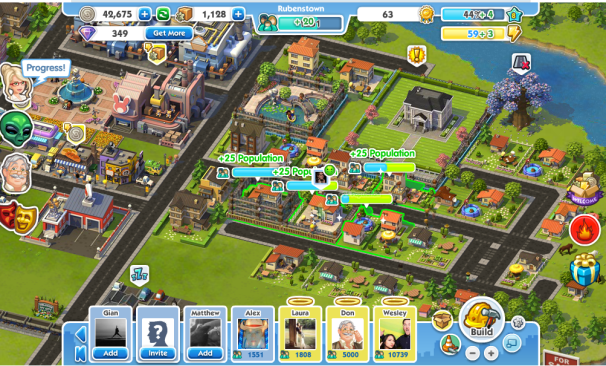 Visiting your friends’ cities is essential to some elements of the game. You’ll need people to staff buildings in your town, and while you can totally purchase players to staff them, asking a friend will suffice. It’s the simple Facebook payoff. You can either pay money for something, or just ask someone else on Facebook, in the hope that they will start playing the game too and a continuing chain-effect will occur. I made a mental list of the people sending me requests and only send them back to the same group of people. It’s a simple way to take advantage of the social elements without having to feel like you’re doing PR for the game. 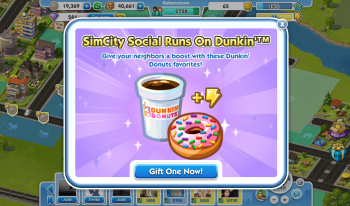 Unlike it’s predecessors, but very much like every other Facebook game out there, SimCity Social limits the number of turns that you can play at a time. They use an arbitrary energy meter that has a specified amount of actions and requires time to recharge once it runs out. Of course, you can purchase energy using Diamonds (the purchasable currency of SimCity Social), or you could just wait. Again, it’s a time vs money proposition. 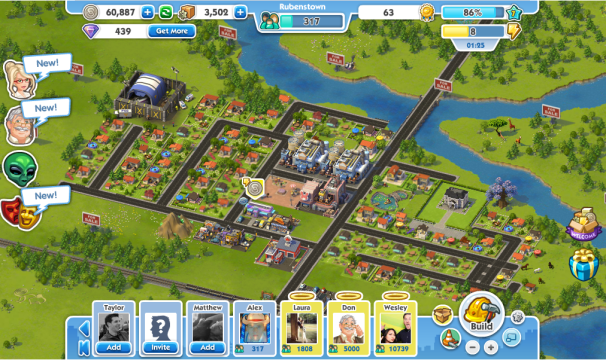 There’s something about SimCity Social that just works. It might be the ease of access or the quick gameplay, but either way, it works. It has me right back into my old ways of deciding whether to try laying out my city to look the best or to be the most functional. If something doesn’t fit, I have to decide whether to tear up the whole block to make it fit right or if I should just put it somewhere else. It’s a constant back and forth and I love it. Listening to me talk about SimCity Social won’t do you any good, you just have to try it for yourself. It’s classic SimCity and should tide everyone over until the next full SimCity release next year.